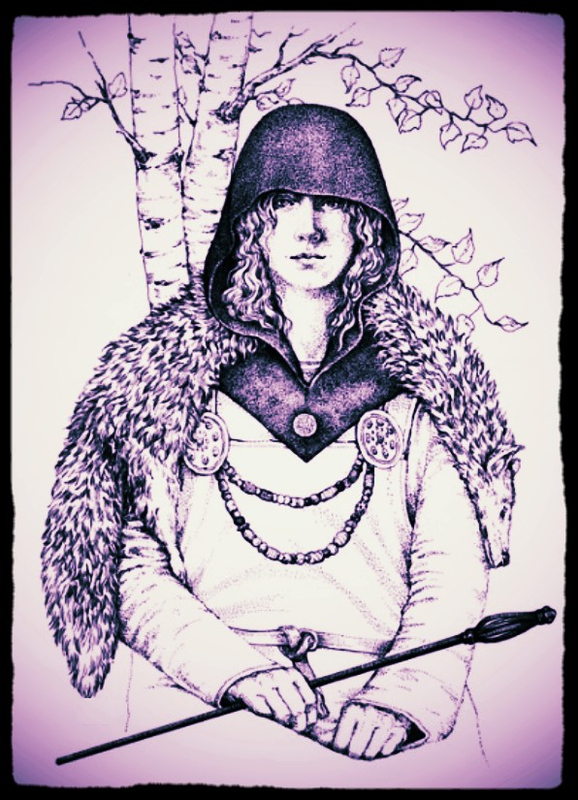 There are seven Scandinavian Viking Age grave finds that fit the criteria of the vǫlur or sorceress. The distribution of the word vǫlva in Old Norse verse also suggests that it was regarded as archaic and used chiefly in mythological contexts. There are nine surviving instances of it in Eddic poems of mythological content: five in Baldrs draumar (stt. 4, 8, 10, 12, 13), and one each in Völuspá (st. 22), Hávamál (st. 87), Lokasenna (st. 24) and Hyndluljóð (st. 33).6 To this we may add only one in a heroic legendary poem - in Helgakviða Hundingsbana I, st. 37, and this clearly belongs to the same tradition of mythological senna as Lokasenna 24, where Loki alleges that Óðinn has practised seiðr on Samsey and beaten on the drum as vǫlur do. There are two instances in Eddic verses embedded in fornaldarsögur (Örvar-Odds saga ch. 32, st. 4, Orms fláttr Stórólfssonar ch. 6, st. 2, see below - both may be older than the prose narratives round them); and three in skaldic verses attributed to the tenth or early eleventh centuries: Kormákr, lausavísa 48;7 the anonymous lausavísa II B 6 (in a stanza defining a giantess);8 and Höfgarða-Refr’s travel verses 2 (where Gymis vǫlva refers to Rán).9 Other words for magic-working women show a similarly restricted currency. Seiðkona (prophecy wife/woman) does not appear in verse at all, and spákona and spámær occur once each, both in allegedly tenth-century verses (Kormákr, lausavísa 53; fiorarinn máhlíðingr, lausavísa 7;10 the second is part of a kenning for spears, which are said to ‘sing’, in a metaphor which suggests knowledge of the sort of inspired verse utterance often attributed to vǫlur). The noun seiðr and the verb síða or seiða are also rather rare. These talented young women were feared and revered for their magical prowess and were during the height of influence present at every major rite of passage including assisting in making decisions for war or peace as the case may be. Female seiδr practitioners: Vǫlva (staff bearer, seer, sibyl, bones woman), seiðkona (seiδr woman), spákona (prophesy woman), spákerling (old prophesy woman), kveldriδa (evening rider), trollriδa (rider of witchcraft), myrkriδa (darkness rider), munnriδa (mouth rider), túnriδa (fence rider), kaldriδa (cold rider), Þaðriδa (thread rider), galdrakona (galðr woman), galdrakerling (old galðr woman), galdraksnót (galðr lady), galdrakind (negative galðr sorceress), vitka (sorceress), fjolkyngiskona (sorceress), visendakona (wise woman who knows), heiδr (sorceress with good intent), fordæδa (evil witch), fála (witch with bad intent). According to funerary finds and current forensic archaeology, some 50% of Viking Age adult men died between 21 and 30 years of age and this may be because of warfare and the generally turbulent times. For women, the risks were in pregnancy and childbirth and 35% of them did not survive beyond 30 years. The 31 to 40 year olds were the 'middle-aged' people of the Viking Age and 50 years of age would be thought of as 'old'. Women seem to have had an especially high death rate in the age group 41 to 50 when compared with the men, but this is because about eight out of ten of the adult men had already died at an earlier age. The good old days, probably not! It was exceptional for anyone to reach what we would today call 'old age'. The question as to exactly how seiδr staffs were used within a seiδr ritual is a difficult one as we simply do not know. However seiδr staffs it seems from the sources were in the main quite large and ornately fitted with brass set in gemstones. 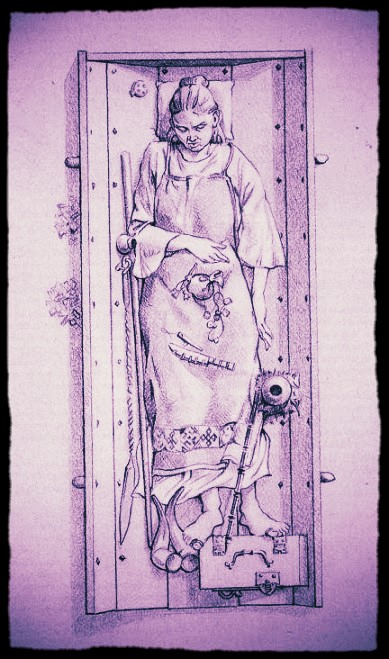 And she had a staff in her hand with a knob on the top, adorned with brass set. No man shall have in his house staff or altar, device for sorcery or sacrificial offering or whatever relates to heathen practice. 1) Stafrs: an attribute of the vǫlva used in the course of summoning varδlokkur spirits as well as for for divination. 4) Stafsprota…used by spákonas in facial attacks on an enemy or to rob them of their memory and instil confusion. A fragment of an Eddic poem Hárbarδzljód (20) suggest that Oδinn got a magic staff (gambantein) from a giant named Hlébarδr. We learn from Skáldskaparmál (4) and Þórsdrápa that the god Þórr borrowed his staf from a spell working giantess, Griδr. A mythical hero of Fjölsvinssmál (26) named Svipdagr tried to obtain a staff from a witch-giantess named Sinmara (Simek 2006:285). In all three cases, the staffs seem to have a particular connection with the giants. It actually seems that they were a product of their hands. This is also clearly suggested in Fjölsvinnsmál (26), where we read that the god Loki (under the name of Lopt) made a magic staff named Lævateinn (Simek 2006:185). 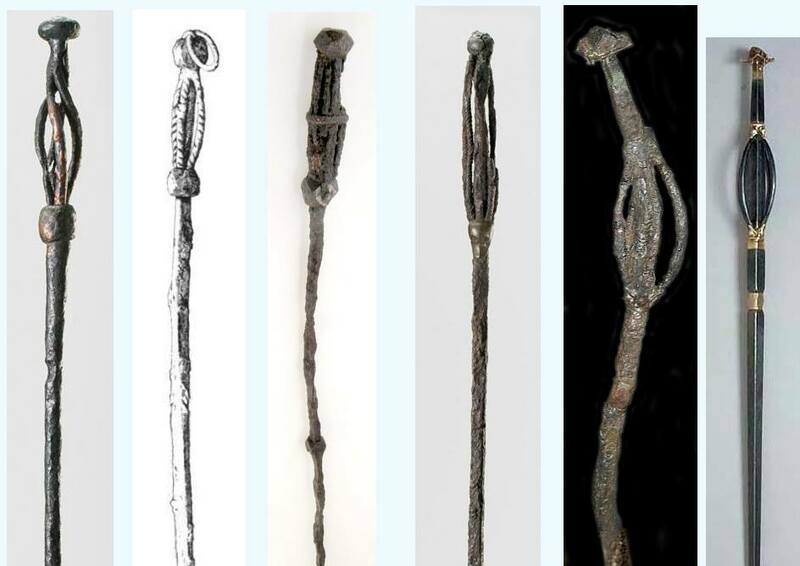 An iron staff or sorcery (járnstafr) held by a giant is also mentioned in Olaf’s saga Tryggvasonar (33). In Styrbjarnar Þattr, Eiríkr receives a staff (reyrsproti) from the god Oδinn and during a battle this item transforms into a spear (Turville-Petre 1975:47) A similar event also occurs in Gautreks saga (7). This is particularly interesting since it seems that spears appear to have a strong connection with the staffs of sorcery. “Since Oδinn does not use his spear as an aggressive weapon, but as a magic instrument, since it alternates with a reed, it is possible to assume that the spear had [been] the magic staff, which is held by the sorceress. The change from reed into deadly weapon is indeed valid in Icelandic texts”. The archaeology finds of iron staffs of sorcery were at first believed to be Viking Age Iron roasting spits. All that has changed today and although at first view, these objects of antiquity found in Birka grave sites may seem ordinary, they are concluded by many scholars to be otherworldly and magical but also that they had more than one author in their manufacture. In fact several people may have used or possessed these staffs throughout the heathen periodic timeline. This is the current thinking. The question as to exactly how seiδr staffs were used within a seiδr ritual is a difficult one as we simply do not know. However seiδr staffs it seems from the sources were in the main quite large and ornately fitted with brass set in gemstones. No man shall have in his house staff or altar, device for sorcery or sacrificial offering or whatever relates to heathen practice.